A little over five years ago I was told that I had bowel cancer. This was in in an office half-full of broken furniture and with a view of a weedy car park, the former site of the Odeon and Paramount cinema. A conjunction of bathos and cheap symbolism that would be rightly edited out of any fiction. Five years on, the office, the building it was in, and the car park, are all gone. Erased by redevelopment. Five years on, after major surgery, seven months of chemotherapy and a small nervous collapse manifesting mostly in anxiety attacks, I'm still here. And I've just been told that my latest and hopefully last CT scan has shown no trace of the disease. Five years on, I'm not cured, because there is as yet no way of determining that a cancer patient is entirely free of cancer cells. But I am no longer in remission. I am, prosaically, inelegantly, happily, NED -- No Evidence of Disease. For which I am of course, immensely grateful. To the NHS, and the staff of University College Hospital London, where I was treated. To my steadfast partner, and everyone who offered condolences and support. To all, again, thank you. But after a brief surge of elation at the good news, in which, yes, the world did look more vivid and significant, as if leaving the cinema after watching a terrific and involving film, life resumes. Partly, this is because someone close to me is currently undergoing treatment for cancer. So cancer is still a very large part of my everyday life. But also because while having cancer is life-changing, no doubt, life goes on anyway. Other stuff insists on happening. The world inconsiderately does not pay full attention to you, and you are not continually bathed in the glorious light of revelation. Which is probably just as well, as it sounds awfully tiring. But you are, of course, abruptly confronted with your own mortality, and the stark realisation that part of your body, that marvelous intricate communal cooperative which you've mostly taken for granted, has rebelled. Cells have regressed to an embryonic state. They are no longer cooperating. Instead, all they want to do is feed and divide. And given the chance, they will continue divide and spread until that marvelous cooperative collapses. They are so greedy for life that they don't care that their greed will kill you, and kill them too. That knowledge is a continual low level dread, and the needling reminder that comes at odd moments in the day, and lies with you, unsleeping, at night: remember, you have cancer. And often it seems the other way around, a version of the old Russian joke. You don't have cancer. Cancer has you. There are two narratives imposed on cancer patients by much of the media. There's the foot soldier in war against cancer, bravely battling the odds. And there's the stoic saint bravely facing her looming unavoidable fate. But if treating cancer is a battle, the patients aren't the foot soldiers. They're the battlefield. And while most of us would all like to aspire to the condition of sainthood, only some of us achieve it. So, I was no foot soldier. I was a battleground. And, regrettably, I was no saint, either. I had a few low-key and somewhat sentimental and commonplace Damascene moments. I was privileged to witness the ability of my fellow patients to endure with dignity and humour (there's no darker humour than the humour of the chemo ward) the various indignities and travails of treatment. But mostly I tried to get on with my life, which meant that I continued to write books and stories and articles, travel when I could, pay the gas bills, so on, so forth. And maybe it was a selfish or unimaginative way of dealing with the situation, but hey. It mostly worked for me. Five years on, then, I'm no longer a patient, but I am not cured. There is no cure. I am NED. I am still subject to survivorship statistics, although the odds have increased massively in my favour. Five years ago, my odds of surviving the next five years -- staying alive with or without evidence of cancer in my body -- were about 60%. Now, because most recurrences of cancer happen within five years of the original treatment, my odds of surviving the next five years are little different to those of everyone my age who hasn't had cancer. That needling little reminder hasn't yet fallen silent. I doubt that it ever will. But it's now in the past tense. It no longer says, remember, you have cancer. It says instead remember, you had cancer. It's no longer a warning. It's a valediction. 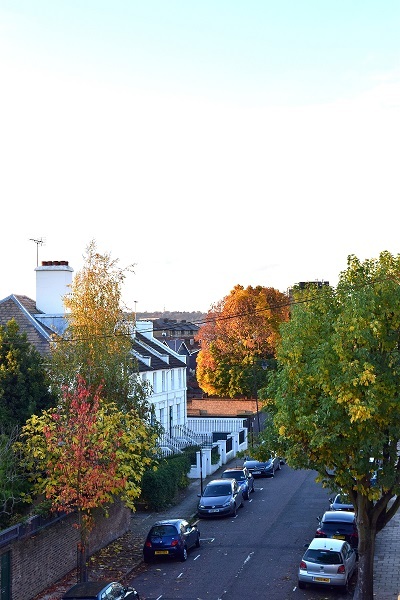 Low afternoon sunlight and leaf colour in London. Two different views of life after the coming of the Jackaroo, those willfully enigmatic aliens who are here to help. Whatever that means. 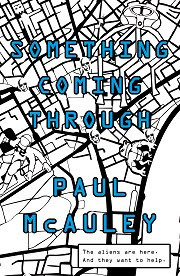 First up, the paperback cover for Something Coming Through, scheduled for publication in January next year. 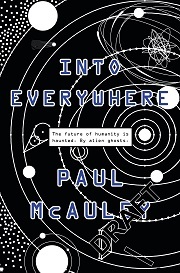 Second, the cover for Into Everywhere, due out in March 2016. Just the draft version at the moment, but it can be found elsewhere in the internet so I thought I'd throw it up here.